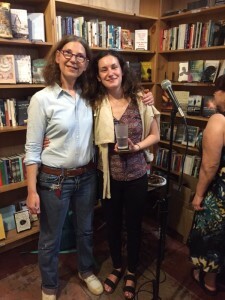 Home » Blog » Surviving Santiago Is Launched! 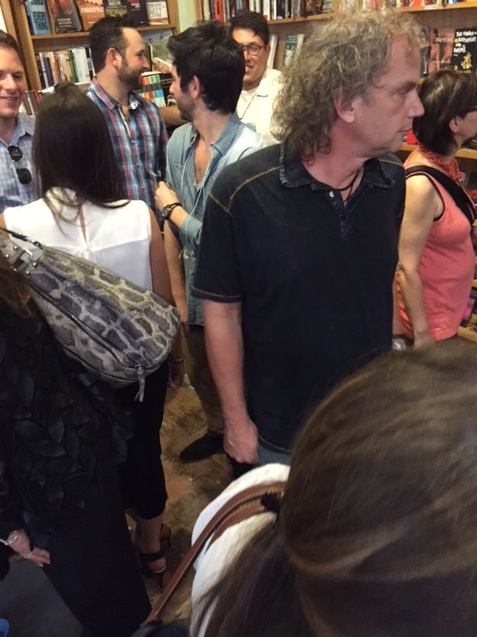 Some of the people at the book launch. Wayne Steck, the father of my son’s girlfriend, is in the center. Derrick is behind him, and Lindsey is to his left, with her back to the camera. 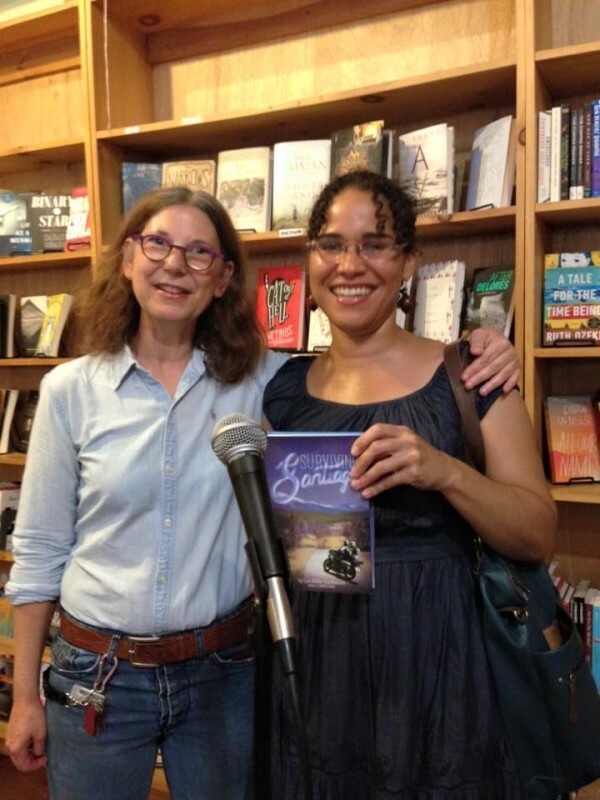 Last Thursday was my official book launch party for Surviving Santiago at the Lower East Side bookstore Bluestockings, ranked one of the top destinations in the Not For Tourists Illustrated Guide to New York City. 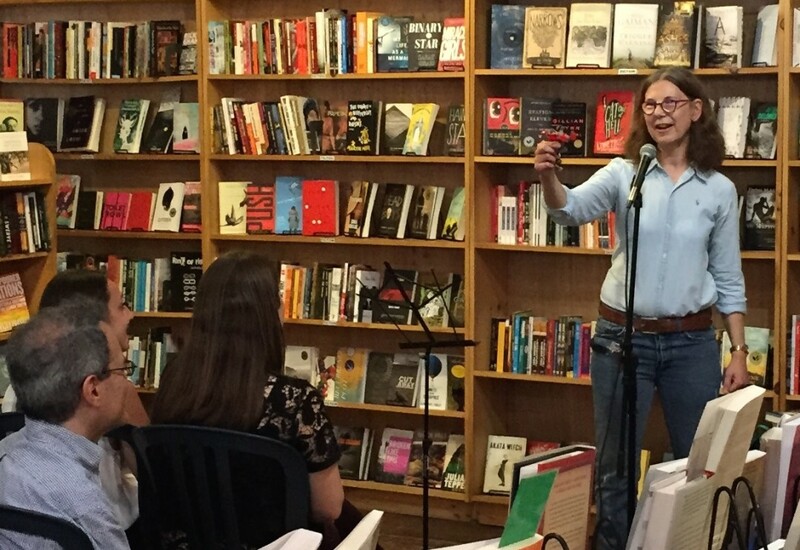 Around 40 people — friends, family, and friends of family — showed up to hear me read a short passage from the novel and ask questions. I read the scene where Tina meets her Chilean boyfriend, Frankie, and answered questions about Surviving Santiago‘s relationship to Gringolandia and sibling rivalry in general (a lot of people raised their hands when I asked, “How many of you believe your parent(s) preferred your sibling?” and the rest were only children), my involvement with the Chilean exile community in the 1980s and trip to Chile in 1990, my LEGO creations, and why We Need Diverse Books. Fellow students from the MFA program at Vermont College, from left Joan Axelrod-Contrada, Katie Bartlett, and Ann Malaspina. Shelley Saposnik was there but not in the picture. Photo by Lisa Amowitz. 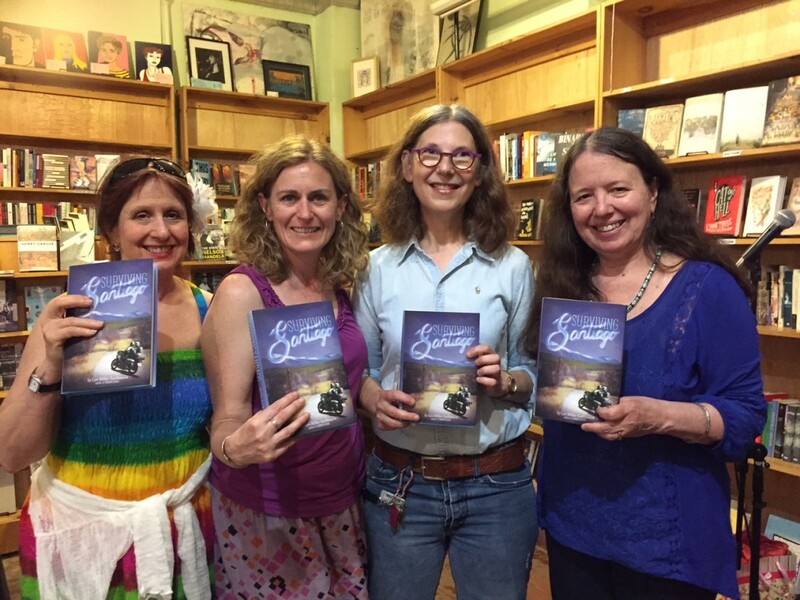 Having never organized a book launch party for either of my other YA novels, I never appreciated their role as a kind of reunion and celebration. At this party, I finally met the father and siblings of my son’s girlfriend, who my husband and I adore (and whose mother attended ComicCon with me last fall). My longtime friend Heather brought her cousin Lena, and they joined us for dinner. My mother came up from Houston for the event. Both of my children invited their friends, giving me the opportunity to introduce my books to a different audience. Four fellow students from Vermont College of Fine Arts showed up, as well as five writers involved with various diversity initiatives and the PEN American Center. I collected a bouquet of flowers, a dozen macarons, and an assortment of chocolates, which made me feel as if I’d starred in my debut theatrical role. I suppose reading is a kind of theater. With author and activist for diversity in children’s literature Zetta Elliott, who asked great questions. I’d like to thank my family and friends for all their support last Thursday evening and over the years. Writing is a solitary journey, and novel-length works involve months and years of effort with no guarantee of anything to show for it. I wrote fiction for ten years between 1980 and 1990 without selling a single thing to a publisher, and I quit after I lost a contract with a major house. The book that caused my heartbreak back then is the one that ultimately became Gringolandia. I simply couldn’t let it go. And Surviving Santiago would never have existed without Gringolandia. 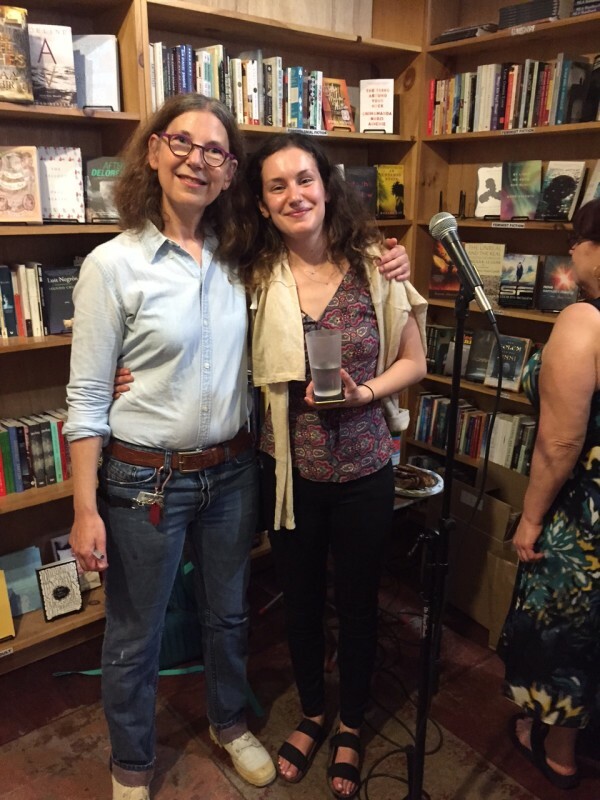 With daughter, Maddy, who at age 16 was Surviving Santiago’s first reader. She contributed a chapter that later got cut. In commenting on my last post about the Portuguese bullfight, Luís Capucha wrote about the fighters looking the bull eye-to-eye and confronting their fear. Writers don’t have audiences watching when they confront their own failures large and small — characters who staunchly refuse to reveal themselves, plots that fall apart or sag in the middle, settings that never go beyond the generic, the dead-end that can only be resolved through a deus ex machina, words that don’t sing but thud onto the page. For us writers, a wrong move isn’t going to result in death or permanent disability — either our own or others’. But it’s who we are and what we do, and if we believe our stories matter, then we write facing down our fear of failure and celebrating our successes. Reading from the book, where Tina meets Frankie. During the Q & A I showed off a LEGO Book Rocket that I created, and a miniature version of Surviving Santiago. Put the book into the engine compartment, and the book will take you to its setting. 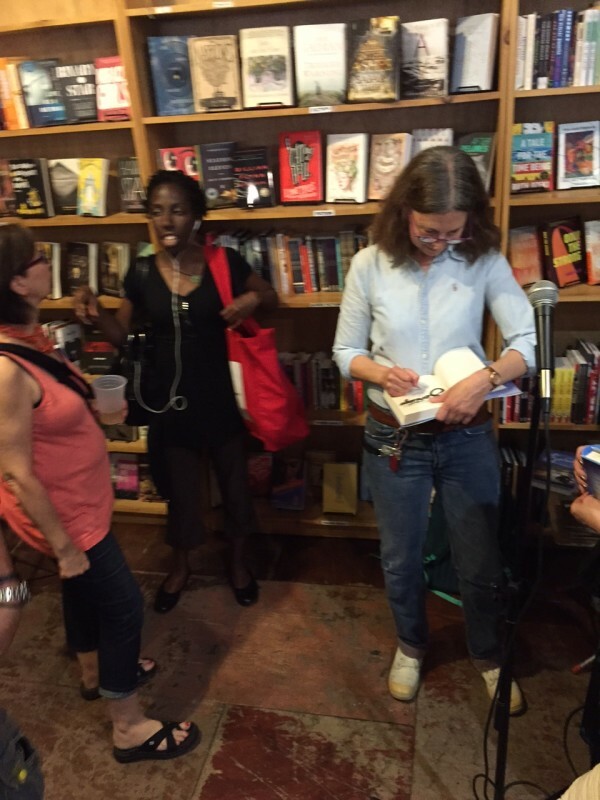 Bluestockings is a really cool bookstore, but this picture will not go into any mainstream media outlets. Signing a book. In the background are, from left, authors Lisa Amowitz and Jenn Baker. With Maria Andreu. 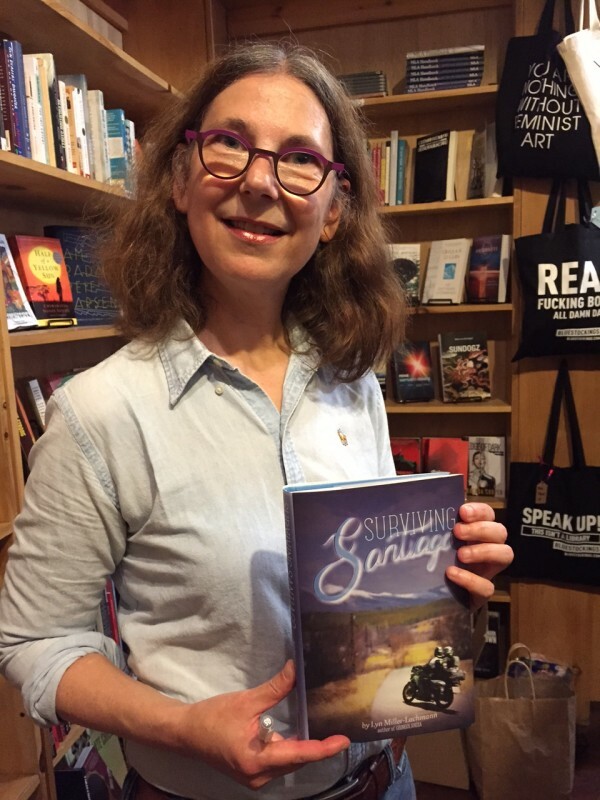 Reading her wonderful debut YA novel The Secret Side of Empty convinced me to go with Running Press for Surviving Santiago. What a great launch party, Lyn. So much fun and such a success. I wish I could have been there! I received Surviving Santiago on Tuesday and finished reading it today. Well done! 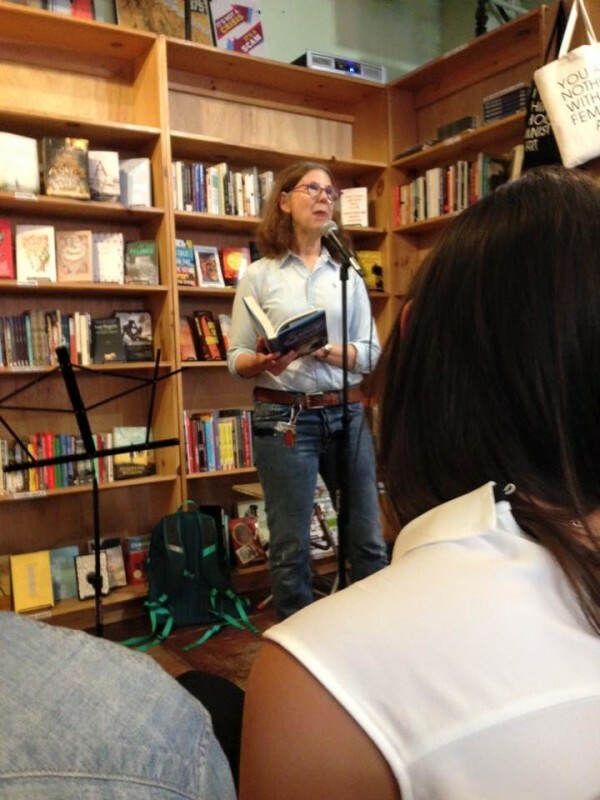 From the start of the book, I was in Tina’s corner . . . seeing the world through her eyes. Through them, I enjoyed meeting her aunt, saw the challenges of living with her father, loved the birds, recoiled from Rafael, and felt her attraction to Frankie. So glad I entered the contest on Linda’s blog, El Space. Con su permiso, I shall donate the book to the Island Library for others to read and enjoy. Thank you, Nancy! I’m thrilled that you enjoyed Surviving Santiago so much. I’m a big fan of libraries, and making more books available to readers there, so please feel free to pass the book along and let folks in your community know it’s there. 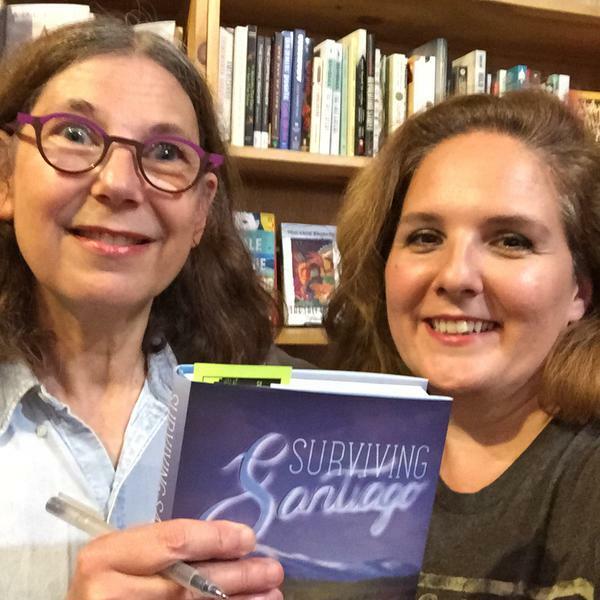 I gave Surviving Santiago to the island library on Saturday, along with your address (in case the librarian wanted to keep a record or send a thank you note). Lyn!! How awesome! So nice to see your photos. I wish I could have been there. So glad it’s out and in the world. Thank you, Linda! I hope to get to Chicago and to a bookstore in your area — maybe next year around the time of BEA, since it will be in Chicago in May 2016.